Chicago at night is a luminous display of architectural achievement. The city shines with skyscraping works of art, embellished with dramatic accent lights. Unfortunately, those lights can prove deadly to migrating birds. That’s where the Chicago Bird Collision Monitors comes in. From August 15 until November 15, this organization champions a lights-out program in downtown so that birds can safely conduct their fall migrations. However, even with this assistance, CBCM picks up approximately 7,000 injured birds a year — representing as many as 100 different species — in the one square mile it monitors. The following is an edited and condensed version of two conversations with CBCM director Annette Prince. What is the purpose of Chicago Bird Collision Monitors? We were founded as a migratory bird conservation and rescue program to make people aware of the risks of lights and building design. We go out into the urban areas to rescue and observe the fatalities and injuries of migratory birds in an area with hazardous building and light design. What would be examples of hazardous building and light designs? We found that night-migrating birds are attracted to rooftop lighting that fills the sky. Birds are drawn toward the lights, which they circle endlessly to the point of either exhaustion or strikes. These can be any of a variety of bright display lights at higher levels. For example, the flood lights on building antennas, decorative outlines around the silhouette of a building, a lighted clock face on an upper story, or even a brightly illuminated building logo. Also, glass can prove hazardous because its reflection presents a deceptive image that birds believe they can fly toward, such as the sky or trees. Glass is also hazardous when it is transparent because birds think they can fly through it. What kinds of preventative steps are the Chicago Bird Collision Monitors taking? We have worked with the Chicago Audubon Society to implement the Chicago “Lights Out” program. We ask for the voluntary participation of all multi-story and lakefront buildings in extinguishing all non-essential lights during the spring and fall migration season every night at 11:00. We also put “shields” on the top of street or exterior building lights. These concentrate the light down toward the people who need it and prevent potentially dangerous light from going up into the night sky where it can disorient and attract birds. CBCM was instrumental in making the contacts with property management that have gained almost 100% participation each migration season. We would now like to see Chicago make the Lights Out policy a city ordinance. CBCM also has a best building/lighting practices guide on our new website. We offer people that have bird safety concerns our expertise about which areas of their buildings pose the greatest risks to birds, and offer them solutions. Changes people can make to their buildings to reduce hazards for birds may involve using bird-safety glass, applying protective films to glass in order to reduce reflections and transparency, and placing protective barriers in front of glass surfaces such as banners, screens, lattices and plants. CBCM collaborates with national organizations such as the American Bird Conservancy to communicate the need to incorporate bird safety into building designs. The buildings with the highest LEED (Leadership in Energy and Environmental Design) statuses are often the ones causing the most harm to birds. We don’t think a building is a leader in environmental design if it causes great numbers of bird deaths. We hope that the awareness we raise through our monitoring, rescuing, educational presentations and outreach will make bird safety a priority in future designs. In a perfect world, extinguishing or dimming all building lights is ideal. It prevents birds from fatal attractions, it saves energy, and it is better for human health, which has suffered from the effects of continual lighting. Humans and other life evolved in a world that had regular periods of total darkness. How much of the most “dangerous” area of downtown Chicago does the 1 square mile that CBCM monitors cover? All areas are dangerous except those with an absence of buildings. Any area that has structures with elements of hazardous lighting and/or glass can be hazardous to birds. 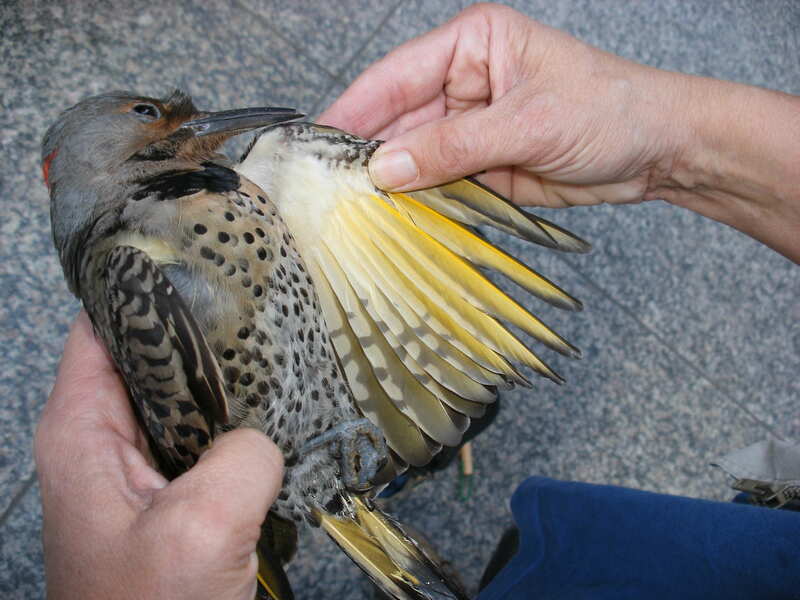 It is impossible to predict or control where birds may find themselves in the city. One predictor of a location where birds might settle would be attractive landscaping that offers shelter and places to feed. The routes we cover include: almost all of the tallest downtown buildings; buildings that incorporate or are proximal to attractive landscaping; and structures closest to Lake Michigan and the Chicago River. Buildings close to these natural areas are in the path of migrating birds. How was this area chosen? Our routes have developed around concentrations of buildings that allow monitors to efficiently survey on foot and be near drop-off and rendezvous points. Some areas are those which have had historically higher reports of birds in trouble and others are locations with newly discovered concerns. We know there are many other places we could be finding birds both near the downtown and the lakefront, but some of these locations are more spread out. That being said, we are always looking to expand routes depending on the availability of more volunteers. What is the most interesting or inspirational story you have from your work at CBCM? I think it’s always the moments when we encounter a member of the public or of building staff who has caught a bird — a bird that’s been injured — and they’ve gotten that bird to safety and they’re so excited. Just seeing how enthusiastic people are. They’re simply amazed at these birds because the birds are species you never see in downtown Chicago. They are usually 60 stories up in the air and they can migrate from as far as Brazil. Being able to support that kind of enthusiasm is the most rewarding part. I think that the architecture of Chicago is amazing and I wish we could find a way to make it not so deadly. Taylor Kubota has always loved learning. She studied biological anthropology and health care/social issues at the University of California, San Diego, which allowed her to take classes in ten different departments. While an undergraduate, she also worked seven jobs, ranging from work in student affairs to a museum volunteer position. In the hopes of continuing (and sharing) her life of diverse learning, she is honored to be a part of SHERP’s 30th class. Follow her on Twitter or visit her website.